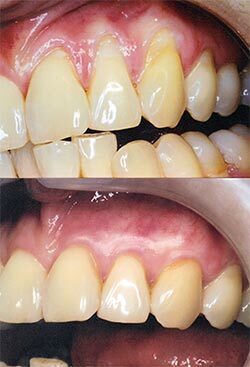 Increase in the zone of attached and keratinized gingiva to stop further gum recession. Pre-prosthetic gingival augmentation for full coverage dental restorations (crown and bridges). Neither FGG nor LPG were indicated or performed to cover exposed roots. Here is the photograph illustrating FGG performed on lower incisor teeth with no root coverage achieved on either incisor tooth. Note the bulky and anaesthetic gingival contour present after the surgery. One of the major problems associated with FGG was a long and very painful healing period, which scared periodontal patients and at times precluded them from getting recommended treatment. On the other hand, one of the risks associated with LPG was producing gum recession of the tooth adjacent to the treatment area. In mid-1980s muco-gingival surgery was revised and amended to evolve into a bigger area of Periodontal Plastic Surgery (PPS). 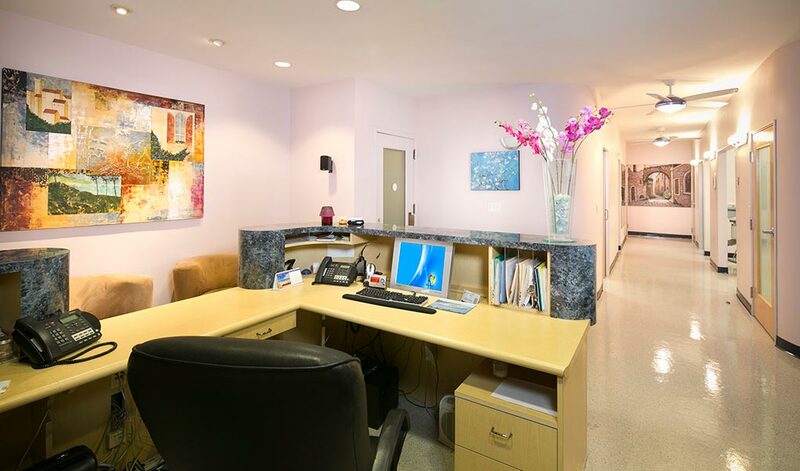 PPS procedures include connective tissue graft, coronal flap with or without a connective tissue graft, soft tissue ridge augmentation, aesthetic crown lengthening and tissue sculpting. Connective tissue graft (CTG) is the foundation of most smile enhancement procedures, providing very predictable and highly aesthetic results, achieving all the goals of earlier muco-gingival surgery and more, covering the exposed roots and recreating a natural gingival contour, preparing the area for cosmetic and restorative dental work, and at the same time being very atraumatic and comfortable for patients. Pain is one of the major reasons why people choose not to proceed with recommended treatment. Earlier FGG procedure was associated with 2-3 weeks of painful healing since the graft was scraped from the surface of the roof of the mouth area leaving behind a large wound. Newer CTG procedure still uses the roof of the mouth for the source of tissue, since it is abundant and of best quality, allowing predictable root coverage of multiple teeth vs. just one or two teeth at a time. However, unlike FGG there is no wound after the tissue is removed, since the tissue is taken from the inner area of the roof of the mouth with a single incision. This incision is closed with dissolvable stitches at the end, therefore eliminating post-operative pain and discomfort. After just 2 weeks of healing the roof of the mouth area looks untouched since the incision line heals uneventfully. CTG with coronal flap providing root coverage, treating root abrasions, root caries and hypersensitivity, and augmenting thin gingiva is the most predictable periodontal surgical procedure with over 90% predictable success rate. There are some periodontists who claim obtaining graft tissue from the area behind the last upper molar tooth or the "back of the mouth" (maxillary tuberosity) produces more esthetic results and minimizes surgical recovery time. That statement is quite misleading. While it is definitely true that a CTG obtained from the tuberosity is vastly superior to an old FGG technique, when comparing a CTG taken from the maxillary tuberosity with a CTG taken from the interior palate there is no clinical difference. 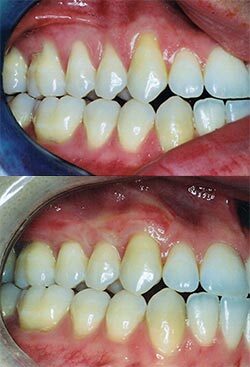 Both CTG techniques produce similar esthetic and clinical results. However on the downside, a CTG taken from the maxillary tuberosity offers only limited coverage of 1-2 teeth at one time, since good quality subepithelial tissue in the maxillary tuberosity area is very scarce. Conversely, a CTG taken from the inner area of the roof of the mouth can cover up to 4 teeth at a time, and in combination with coronal flap an entire quadrant of teeth can be done in a single surgical appointment. Several years ago a different concept was introduced to the field of PPS with an idea to eliminate any donor sites inside the mouth and use processed skin grafts from cadavers for the tissue source. While an idea was excellent, clinical results were not as predictable and aesthetic as CTG procedure. Moreover, patients who are predisposed to delayed healing due to medically compromising conditions may experience partial or complete graft failure. 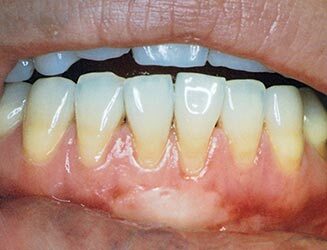 Currently, some periodontists are advocating the use of bio-fillers in combination with coronal flap to treat deep root exposures associated with gingival recession. Some of the results look very natural and satisfy aesthetic demand of the PPS. More clinical data is necessary to determine the predictability and longevity of this new combination technique. In summary, versatility of PPS procedures now allows periodontal plastic surgeons to create the framework for the perfect smile even in most difficult and compromising conditions. The technique has been extensively researched and clinically implemented, therefore making the surgery predictable, safe and very aesthetic. Connective tissue graft remains the procedure of choice in most smile enhancement cases with or without cosmetic dental work.